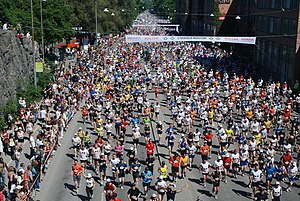 Image via Wikipedia Image via WikipediaSo have you decided that you want to run a marathon? Well we at East Penn Foot & Ankle Associates want to help you along the way. 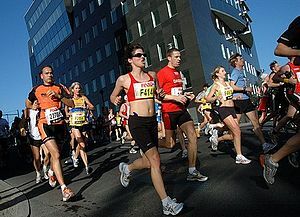 To do this, we’re going to be writing about how to go about training for a marathon for some blogs. So whatever your motivation, we want you to train correctly and avoid injuries. So first, before you get going out, there are some things you need to consider. First of all is that you need to consider the equipment you have. This doesn’t mean that you need to go out and spend hundreds of dollars getting all the best running gear, but you need also to make sure that the gear you have isn’t going to keep you from enjoying this new hobby. Mostly you need to make sure that your shoes are up for the extreme punishment that you are about to put them through. The constant pounding of your feet to the ground means that your shoes need to be supportive, durable, and comfortable. Your get the supportive part from sole of the shoe. Make sure to get shoes that match your foot arch and that the shoe is sturdy even that it doesn’t bend in the middle. The durability of a shoe depends on how sturdy the sole is on the outside of the shoe. Make sure that you get a running shoe that can take on payment, grass, and whatever else. Lastly, the comfortability of the shoe comes from the insole of the shoe. Again, make sure to get an insole that fits your foot arch. Also make sure to have get a shoe with a nice cushion to help protect your feet. You can get other equipment for running, but the shoes are the most important piece, kind of like a helmet is for a football player. If you have any questions, please contact us as we would love to help you get into running. Make sure to watch for more tips on training for a marathon and get going! Wow, training for a marathon sounds like a lot of work! Having the right equipment for your feet is so important. Taking care of your feet is essential if you're going to put them through this much stress.